The 2012 novel Wonder by R.J. Palacio is about a student starting public school after having been homeschooled because of physical problems caused by a severe facial deformity (mandibulofacial dysostosis, more commonly known as Treacher Collins Syndrome). Dealing with ‘other’ing in classroom and social settings is a common challenge for our exceptional learners, so the novel was taught in DAL Learning Centers, both in the 2013-14 and 2017-18 school years. 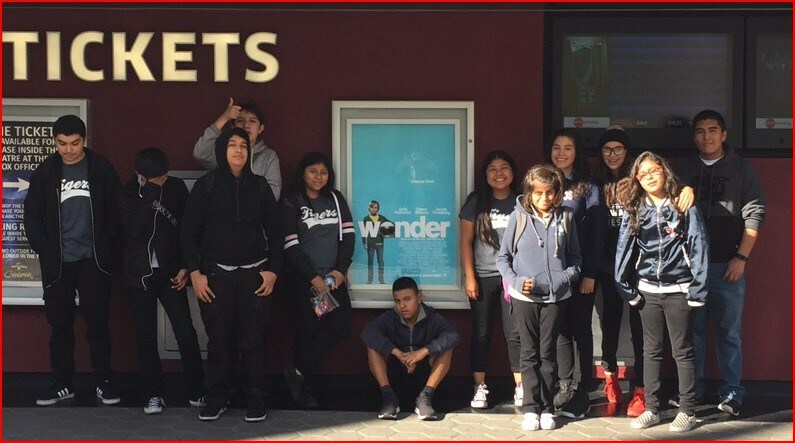 When the book was made into a movie and released in November 2017, a field trip to Universal Citywalk was arranged for both current students and recent alumni. The students appreciated the opportunity to compare the movie to the book we explored in Learning Center, to hear from alumni about life after high school as a person with a learning disability, and to take the Metro Red Line from school. One of the students went on to buy their own copy of the book that included changes and photos from the film. As part of the field trip, the students also took a brief look into local history. At the Universal City Metro Station, the students interacted with Margaret Garcia’s 2000 work The Tree of Califas. According to metro.net, the Universal City station is adjacent to the historic site of the Campo de Cahuenga, where in 1847 Mexico relinquished control of California to the United States. The station, designed by artist Margaret Garcia and architect Kate Diamond, focuses on the significance of this event to California’s history. California was named by the Spaniards after the mythological black Amazon queen Califas, who was said to have ruled a tribe of women warriors. Visitors descending into the station are greeted with a historical timeline highlighting key dates and events related to the area’s past. A series of highly stylized trees on the station platform provide a dynamic canopy over the interior space. Symbolizing life, time and growth, the design of these interior trees was influenced by the mature pepper trees that once lined Lankershim Boulevard. 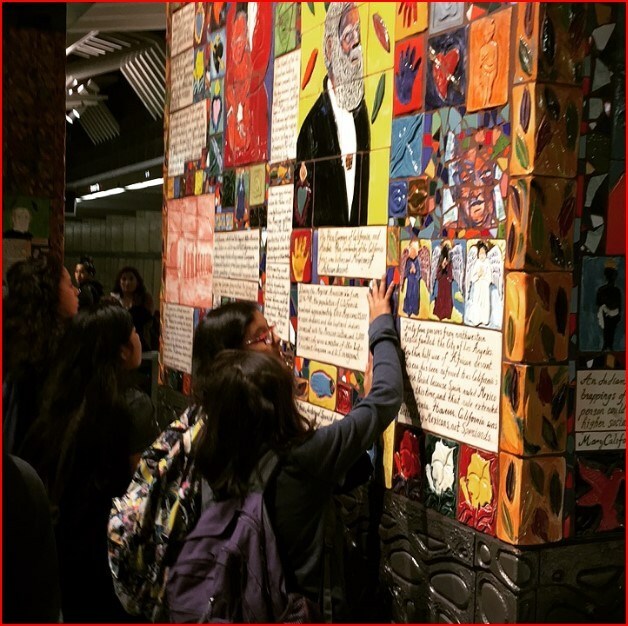 Each tree trunk is clad in handmade colorful art tiles that reflect the history of the area and its people, and offers a visual and textual narrative of the events leading up to the Capitulation of Cahuenga. The Mayan letter “G” appears as a consistent design element throughout the station, in screened porcelain wall panels, cast iron railings, wainscoting and benches, and on the elevator glass, and symbolizes all beginnings and all endings. The artist and architect have titled the project, The Trees of Califas. What is the Ethnic Studies for All Initiative?